Create an elegant spring display with Carnegie Giant Fragrant Hyacinths. This variety, called 'giant' for their sturdy 8- to 10-inch stalks, are both taller and fuller than other hyacinth cultivars. Each stalk is wrapped in an ivory bundle of densely packed star-shaped florets. The snowy hues of these flowers are enriched by their deliciously sweet fragrance. 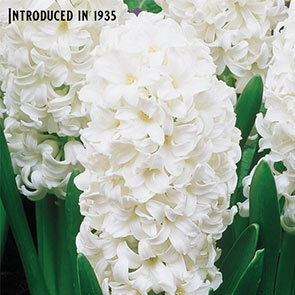 Blooming in early to mid spring, Carnegie hyacinths make a beautiful counterpoint to your other seasonal flowers. 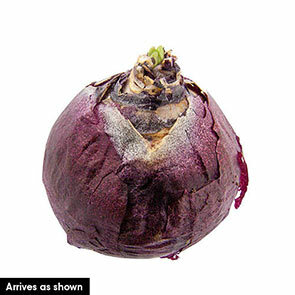 To plant your Dutch hyacinth bulbs, select a spot that receives full to partial sun. Bury these deer-resistant bulbs 6 inches deep and space them 4 to 6 inches apart. They may be planted singly or in groups. Preferring well-drained clay, sand or loamy soil, Carnegie hyacinth flowers are hardy in zones 4 through 8. These lovely perennials are long-lived and will return for years to come. In formal gardens, plant these stately hyacinths in rows along walkways or in borders. Consider pairing them with soft pink or blue giant hyacinths. With their compact shape and upright growth, hyacinths are ideal for creating patterns and geometric shapes. In cottage gardens, strew these white hyacinth bulbs amongst orchid irises, daffodils, grape hyacinth and Spanish bells for blooms all spring long. Be sure to place some Carnegie giant fragrant hyacinths in areas where you can appreciate their heady scent. Bigger blooms for a stronger perfume. Pure white bells of impressive size adorn this dramatic showpiece. Our Giant Hyacinths are top crowd pleasers! 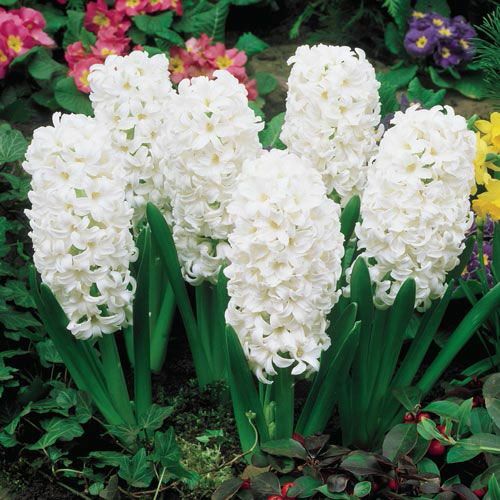 No other hyacinth delivers the sensory impact of our spectacular Giant Hyacinths. Breck's varieties are large, garden-size bulbs that result in large, full flower heads just covered with densely packed florets. Unbelievable colours glitter in your spring garden and return each year with minimum care. If you can't wait for spring, try forcing these bulbs in the late winter for a memorable indoor show.